Unless otherwise specified, Chinese text in this article is written in the format (Simplified Chinese / Traditional Chinese; Pinyin). If the Simplified and Traditional Chinese characters are identical, they are written only once. For the species of moth known as "Chinese Character", see Cilix glaucata. Chinese characters are logograms used in the writing of Chinese and some other Asian languages. In Standard Chinese, and sometimes also in English, they are called hànzì (simplified Chinese: 汉字; traditional Chinese: 漢字). They have been adapted to write a number of other languages including: Japanese, where they are known as kanji, Korean, where they are known as hanja, and Vietnamese in a system known as chữ Nôm. Collectively, they are known as CJK characters. In English, they are sometimes called Han characters. Chinese characters constitute the oldest continuously used system of writing in the world. By virtue of their widespread current use in East Asia, and historic use throughout the Sinosphere, Chinese characters are among the most widely adopted writing systems in the world. Chinese characters number in the tens of thousands, though most of them are minor graphic variants encountered only in historical texts. Studies in China have shown that functional literacy in written Chinese requires a knowledge of between three and four thousand characters. In Japan, 2,136 are taught through secondary school (the Jōyō kanji); hundreds more are in everyday use (note that the characters used in Japan are distinct from those used in China in many respects). There are various national standard lists of characters, forms, and pronunciations. Simplified forms of certain characters are used in mainland China, Singapore, and Malaysia; the corresponding traditional characters are used in Taiwan, Hong Kong, Macau, and to a limited extent in South Korea. In Japan, common characters are written in post-WWII Japan-specific simplified forms (shinjitai), which are closer to traditional forms than Chinese simplifications, while uncommon characters are written in Japanese traditional forms (kyūjitai), which are virtually identical to Chinese traditional forms. In South Korea, when Chinese characters are used they are of the traditional variant and are almost identical to those used in places like Taiwan and Hong Kong. Teaching of Chinese characters in South Korea starts in the 7th grade and continues until the 12th grade where 1,800 total characters are taught albeit these characters are only used in certain cases (on signs, academic papers, historical writings, etc.) and are slowly declining in use. In Old Chinese (and Classical Chinese, which is based on it), most words were monosyllabic and there was a close correspondence between characters and words. In modern Chinese (esp. Mandarin Chinese), characters do not necessarily correspond to words; indeed the majority of Chinese words today consist of two or more characters due to the merging and loss of sounds in the Chinese language over time. Rather, a character almost always corresponds to a single syllable that is also a morpheme. However, there are a few exceptions to this general correspondence, including bisyllabic morphemes (written with two characters), bimorphemic syllables (written with two characters) and cases where a single character represents a polysyllabic word or phrase. Modern Chinese has many homophones; thus the same spoken syllable may be represented by many characters, depending on meaning. A single character may also have a range of meanings, or sometimes quite distinct meanings; occasionally these correspond to different pronunciations. Cognates in the several varieties of Chinese are generally written with the same character. They typically have similar meanings, but often quite different pronunciations. In other languages, most significantly today in Japanese and sometimes in Korean, characters are used to represent Chinese loanwords, to represent native words independent of the Chinese pronunciation, and as purely phonetic elements based on their pronunciation in the historical variety of Chinese from which they were acquired. These foreign adaptations of Chinese pronunciation are known as Sino-Xenic pronunciations, and have been useful in the reconstruction of Middle Chinese. When the script was first used in the late 2nd millennium BC, words of Old Chinese were generally monosyllabic, and each character denoted a single word. Increasing numbers of polysyllabic words have entered the language from the Western Zhou period to the present day. It is estimated that about 25–30% of the vocabulary of classic texts from the Warring States period was polysyllabic, though these words were used far less commonly than monosyllables, which accounted for 80–90% of occurrences in these texts. The process has accelerated over the centuries as phonetic change has increased the number of homophones. It has been estimated that over two thirds of the 3,000 most common words in modern Standard Chinese are polysyllables, the vast majority of those being disyllables. The most common process has been to form compounds of existing words, written with the characters of the constituent words. Words have also been created by adding affixes, reduplication and borrowing from other languages. Polysyllabic words are generally written with one character per syllable. [lower-alpha 2] In most cases the character denotes a morpheme descended from an Old Chinese word. 宿 has readings *sjuk > sjuwk > sù 'to stay overnight' and *sjuks > sjuwH > xiù 'celestial "mansion"'. 说/説 has readings *hljot > sywet > shuō 'speak' and *hljots > sywejH > shuì 'exhort'. 折 has readings *tjat > tsyet > zhé 'to bend' and *djat > dzyet > shé 'to break'. Chinese characters represent words of the language using several strategies. A few characters, including some of the most commonly used, were originally pictograms, which depicted the objects denoted, or ideograms, in which meaning was expressed iconically. The vast majority were written using the rebus principle, in which a character for a similarly sounding word was either simply borrowed or (more commonly) extended with a disambiguating semantic marker to form a phono-semantic compound character. 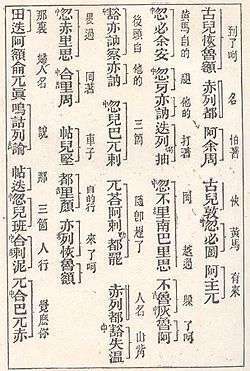 The traditional six-fold classification (liùshū 六书 / 六書 "six writings") was first described by the scholar Xu Shen in the postface of his dictionary Shuowen Jiezi in 100 AD. While this analysis is sometimes problematic and arguably fails to reflect the complete nature of the Chinese writing system, it has been perpetuated by its long history and pervasive use. Pictograms make up only a small portion of Chinese characters. Characters in this class derive from pictures of the objects they denote. Over time they have been standardized, simplified, and stylized to make them easier to write, and their derivation is therefore not always obvious. Examples include 日 rì for "sun", 月 yuè for "moon", 木 mù for "tree" or "wood", and 麻 má for "hemp". There is no concrete number for the proportion of modern characters that are pictographic in nature; however, Xu Shen placed approximately 4% of characters in this category. Also called simple indicatives, this small category contains characters that are direct iconic illustrations. Examples include 上 shàng "up" and 下 xià "down", originally a dot above and below a line. Also translated as logical aggregates or associative compounds, these characters have been interpreted as combining two or more pictographic or ideographic characters to suggest a third meaning. Commonly cited examples include 休 "rest" (composed of the pictograms 人 "person" and 木 "tree") and 好 "good" (composed of 女 "woman" and 子 "child"). Xu Shen placed approximately 13% of characters in this category. However, many of these characters are now believed to be phono-semantic compounds whose origin has been obscured by subsequent changes in their form. Some scholars reject the applicability of this category to any of the compound characters devised in ancient times, maintaining that now-lost "secondary readings" are responsible for the apparent absence of phonetic indicators. In contrast, ideographic compounds are common among characters coined in Japan. Also, a few characters coined in China in modern times, such as 鉑 platinum, "white metal" (see chemical elements in East Asian languages) belong to this category. Also called borrowings or phonetic loan characters, the rebus category covers cases where an existing character is used to represent an unrelated word with similar or identical pronunciation; sometimes the old meaning is then lost completely, as with characters such as 自 zì, which has lost its original meaning of "nose" completely and exclusively means "oneself", or 萬 wàn, which originally meant "scorpion" but is now used only in the sense of "ten thousand". Rebus was pivotal in the history of writing in China insofar as it represented the stage at which logographic writing could become purely phonetic (phonographic). Chinese characters used purely for their sound values are attested in the Chun Qiu 春秋 and Zhan Guo 戰國 manuscripts, in which zhi 氏 was used to write shi 是 and vice versa, just lines apart; the same happened with shao 勺 for Zhao 趙, with the characters in question being homophonous or nearly homophonous at the time. Semantic-phonetic compounds or pictophonetic compounds are by far the most numerous characters. These characters are composed of two parts: one of a limited set of characters (the semantic indicator, often graphically simplified) which suggests the general meaning of the compound character, and another character (the phonetic indicator) whose pronunciation suggests the pronunciation of the compound character. In most cases the semantic indicator is also the radical under which the character is listed in dictionaries. Examples are 河 hé "river", 湖 hú "lake", 流 liú "stream", 沖 chōng "surge", 滑 huá "slippery". 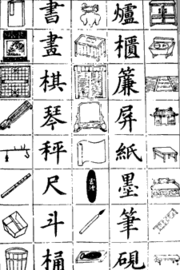 All these characters have on the left a radical of three short strokes (氵), which is a reduced form of the character 水 shuǐ meaning "water", indicating that the character has a semantic connection with water. The right-hand side in each case is a phonetic indicator. For example, in the case of 沖 chōng (Old Chinese *ɡ-ljuŋ) "surge", the phonetic indicator is 中 zhōng (Old Chinese *k-ljuŋ), which by itself means "middle". In this case it can be seen that the pronunciation of the character is slightly different from that of its phonetic indicator; the effect of historical sound change means that the composition of such characters can sometimes seem arbitrary today. Xu Shen (c. 100 AD) placed approximately 82% of characters into this category, while in the Kangxi Dictionary (1716 AD) the number is closer to 90%, due to the extremely productive use of this technique to extend the Chinese vocabulary. This method is still sometimes used to form new characters, for example 钚 / 鈈 bù ("plutonium") is the metal radical 滑 jīn plus the phonetic component 不 bù, described in Chinese as "不 gives sound, 滑 gives meaning". Many Chinese names of elements in the periodic table and many other chemistry-related characters were formed this way. Occasionally a bisyllabic word is written with two characters that contain the same radical, as in 蝴蝶 húdié "butterfly", where both characters have the insect radical 虫. A notable example is pipa (a Chinese lute, also a fruit, the loquat, of similar shape) – originally written as 批把 with the hand radical, referring to the down and up strokes when playing this instrument, which was then changed to 枇杷 (tree radical), which is still used for the fruit, while the character was changed to 琵琶 when referring to the instrument. In other cases a compound word may coincidentally share a radical without this being meaningful. The smallest category of characters is also the least understood. In the postface to the Shuowen Jiezi, Xu Shen gave as an example the characters 考 kǎo "to verify" and 老 lǎo "old", which had similar Old Chinese pronunciations (*khuʔ and *c-ruʔ respectively) and may once have been the same word, meaning "elderly person", but became lexicalized into two separate words. The term does not appear in the body of the dictionary, and is often omitted from modern systems. According to legend, Chinese characters were invented by Cangjie, a bureaucrat under the legendary Yellow Emperor. Inspired by his study of the animals of the world, the landscape of the earth and the stars in the sky, Cangjie is said to have invented symbols called zì (字) – the first Chinese characters. The legend relates that on the day the characters were created, people heard ghosts wailing and saw crops falling like rain. In recent decades, a series of inscribed graphs and pictures have been found at Neolithic sites in China, including Jiahu (c. 6500 BC), Dadiwan and Damaidi from the 6th millennium BC, and Banpo (5th millennium BC). Often these finds are accompanied by media reports that push back the purported beginnings of Chinese writing by thousands of years. However, because these marks occur singly, without any implied context, and are made crudely and simply, Qiu Xigui concluded that "we do not have any basis for stating that these constituted writing nor is there reason to conclude that they were ancestral to Shang dynasty Chinese characters." They do however demonstrate a history of sign use in the Yellow River valley during the Neolithic through to the Shang period. The earliest confirmed evidence of the Chinese script yet discovered is the body of inscriptions carved on oracle bones from the late Shang dynasty (c. 1200–1050 BC). In 1899, pieces of these bones were being sold as "dragon bones" for medicinal purposes, when scholars identified the symbols on them as Chinese writing. By 1928, the source of the bones had been traced to a village near Anyang in Henan Province, which was excavated by the Academia Sinica between 1928 and 1937. Over 150,000 fragments have been found. Oracle bone inscriptions are records of divinations performed in communication with royal ancestral spirits. The shortest are only a few characters long, while the longest are thirty to forty characters in length. The Shang king would communicate with his ancestors on topics relating to the royal family, military success, weather forecasting, ritual sacrifices, and related topics by means of scapulimancy, and the answers would be recorded on the divination material itself. The oracle-bone script is a well-developed writing system, suggesting that the Chinese script's origins may lie earlier than the late second millennium BC. Although these divinatory inscriptions are the earliest surviving evidence of ancient Chinese writing, it is widely believed that writing was used for many other non-official purposes, but that the materials upon which non-divinatory writing was done – likely wood and bamboo – were less durable than bone and shell and have since decayed away. The traditional picture of an orderly series of scripts, each one invented suddenly and then completely displacing the previous one, has been conclusively demonstrated to be fiction by the archaeological finds and scholarly research of the later 20th and early 21st centuries. Gradual evolution and the coexistence of two or more scripts was more often the case. As early as the Shang dynasty, oracle-bone script coexisted as a simplified form alongside the normal script of bamboo books (preserved in typical bronze inscriptions), as well as the extra-elaborate pictorial forms (often clan emblems) found on many bronzes. Left: Bronze fāngzūn (方樽) ritual wine container dated about 1000 BC. The written inscription cast in bronze on the vessel commemorates a gift of cowrie shells (then used as currency in China) from someone of presumably elite status in Zhou dynasty society. Right: Bronze fāngyí (方彝) ritual container dated about 1000 BC. A written inscription of some 180 Chinese characters appears twice on the vessel. The written inscription comments on state rituals that accompanied court ceremony, recorded by an official scribe. Based on studies of these bronze inscriptions, it is clear that, from the Shang dynasty writing to that of the Western Zhou and early Eastern Zhou, the mainstream script evolved in a slow, unbroken fashion, until assuming the form that is now known as seal script in the late Eastern Zhou in the state of Qin, without any clear line of division. Meanwhile, other scripts had evolved, especially in the eastern and southern areas during the late Zhou dynasty, including regional forms, such as the gǔwén ("ancient forms") of the eastern Warring States preserved as variant forms in the Han dynasty character dictionary Shuowen Jiezi, as well as decorative forms such as bird and insect scripts. Proto-clerical script, which had emerged by the time of the Warring States period from vulgar Qin writing, matured gradually, and by the early Western Han period, it was little different from that of the Qin. Recently discovered bamboo slips show the script becoming mature clerical script by the middle-to-late reign of Emperor Wu of the Western Han, who ruled from 141 to 87 BC. Contrary to the popular belief of there being only one script per period, there were in fact multiple scripts in use during the Han period. Although mature clerical script, also called 八分 (bāfēn) script, was dominant at that time, an early type of cursive script was also in use by the Han by at least as early as 24 BC (during the very late Western Han period),[lower-alpha 3] incorporating cursive forms popular at the time, well as many elements from the vulgar writing of the Warring State of Qin. By around the time of the Eastern Jin dynasty, this Han cursive became known as 章草 zhāngcǎo (also known as 隶草 / 隸草 lìcǎo today), or in English sometimes clerical cursive, ancient cursive, or draft cursive. Some believe that the name, based on 章 zhāng meaning "orderly", arose because the script was a more orderly form of cursive than the modern form, which emerged during the Eastern Jin dynasty and is still in use today, called 今草 jīncǎo or "modern cursive". Around the mid-Eastern Han period, a simplified and easier-to-write form of clerical script appeared, which Qiu terms "neo-clerical" (新隶体 / 新隸體, xīnlìtǐ). By the late Eastern Han, this had become the dominant daily script, although the formal, mature bāfēn (八分) clerical script remained in use for formal works such as engraved stelae. Qiu describes this neo-clerical script as a transition between clerical and regular script, and it remained in use through the Cao Wei and Jin dynasties. By the late Eastern Han period, an early form of semi-cursive script appeared, developing out of a cursively written form of neo-clerical script[lower-alpha 4] and simple cursive. This semi-cursive script was traditionally attributed to Liu Desheng c. 147–188 AD,[lower-alpha 5] although such attributions refer to early masters of a script rather than to their actual inventors, since the scripts generally evolved into being over time. Qiu gives examples of early semi-cursive script, showing that it had popular origins rather than being purely Liu’s invention. Regular script has been attributed to Zhong Yao, of the Eastern Han to Cao Wei period (c. 151–230 AD), who has been called the "father of regular script". However, some scholars postulate that one person alone could not have developed a new script which was universally adopted, but could only have been a contributor to its gradual formation. The earliest surviving pieces written in regular script are copies of Yao's works, including at least one copied by Wang Xizhi. This new script, which is the dominant modern Chinese script, developed out of a neatly written form of early semi-cursive, with addition of the pause (頓/顿 dùn) technique to end horizontal strokes, plus heavy tails on strokes which are written to the downward-right diagonal. Thus, early regular script emerged from a neat, formal form of semi-cursive, which had itself emerged from neo-clerical (a simplified, convenient form of clerical script). It then matured further in the Eastern Jin dynasty in the hands of the "Sage of Calligraphy", Wang Xizhi, and his son Wang Xianzhi. It was not, however, in widespread use at that time, and most writers continued using neo-clerical, or a somewhat semi-cursive form of it, for daily writing, while the conservative bafen clerical script remained in use on some stelae, alongside some semi-cursive, but primarily neo-clerical. It was not until the Northern and Southern dynasties that regular script rose to dominant status. During that period, regular script continued evolving stylistically, reaching full maturity in the early Tang dynasty. Some call the writing of the early Tang calligrapher Ouyang Xun (557–641) the first mature regular script. After this point, although developments in the art of calligraphy and in character simplification still lay ahead, there were no more major stages of evolution for the mainstream script. Although most of the simplified Chinese characters in use today are the result of the works moderated by the government of the People's Republic of China in the 1950s and 60s, character simplification predates the republic's formation in 1949. One of the earliest proponents of character simplification was Lufei Kui, who proposed in 1909 that simplified characters should be used in education. In the years following the May Fourth Movement in 1919, many anti-imperialist Chinese intellectuals sought ways to modernise China. In the 1930s and 1940s, discussions on character simplification took place within the Kuomintang government, and many Chinese intellectuals and writers have long maintained that character simplification would help boost literacy in China. In many world languages, literacy has been promoted as a justification for spelling reforms. The People's Republic of China issued its first round of official character simplifications in two documents, the first in 1956 and the second in 1964. In the 1950s and 1960s, while confusion about simplified characters was still rampant, transitional characters that mixed simplified parts with yet-to-be simplified parts of characters together appeared briefly, then disappeared. "Han unification" was an effort by the authors of Unicode and the Universal Character Set to map multiple character sets of the so-called CJK languages (Chinese/Japanese/Korean) into a single set of unified characters and was completed for the purposes of Unicode in 1991 (Unicode 1.0). Chinese characters were first used in Vietnam during the millennium of Chinese rule starting in 111 BC. They were used to write Classical Chinese and adapted around the 13th century to create the Nôm script to write Vietnamese. Chinese characters adapted to write Japanese words are known as Kanji. Chinese words borrowed into Japanese could be written with the Chinese character, while Japanese words could be written using the character for a Chinese word of similar meaning. Because there have been multiple layers of borrowing into Japanese, a single character may have several readings in Japanese. Written Japanese also includes a pair of syllabaries known as kana, derived by simplifying Chinese characters selected to represent syllables of Japanese. The syllabaries differ because they sometimes selected different characters for a syllable, and because they used different strategies to reduce these characters for easy writing: the angular katakana were obtained by selecting a part of each character, while hiragana were derived from the cursive forms of whole characters. Modern Japanese writing uses a composite system, using kanji for word stems, hiragana for inflexional endings and grammatical words, and katakana to transcribe non-Chinese loanwords as well as serve as a method to emphasize native words (similar to how italics are used in Romance languages). In times past, until the 15th century, in Korea, Literary Chinese was the dominant form of written communication, prior to the creation of hangul, the Korean alphabet. Much of the vocabulary, especially in the realms of science and sociology, comes directly from Chinese, comparable to Latin or Greek root words in European languages. However, due to the lack of tones in Korean, as the words were imported from Chinese, many dissimilar characters took on identical sounds, and subsequently identical spelling in hangul. Chinese characters are sometimes used to this day for either clarification in a practical manner, or to give a distinguished appearance, as knowledge of Chinese characters is considered a high class attribute and an indispensable part of a classical education. It is also observed that the preference for Chinese characters is treated as being conservative and Confucian. In Korea, hanja have become a politically contentious issue, with some Koreans urging a "purification" of the national language and culture by totally abandoning their use. These individuals encourage the exclusive use of the native hangul alphabet throughout Korean society and the end to character education in public schools. In South Korea, educational policy on characters has swung back and forth, often swayed by education ministers' personal opinions. At present, middle and high school students (grades 7 to 12) are taught 1,800 characters, albeit with the principal focus on recognition, with the aim of achieving newspaper literacy. Since there is little need to use hanja in everyday life, young adult Koreans are seldom able to read more than a few hundred characters. There is a clear trend toward the exclusive use of hangul in day-to-day South Korean society. Hanja are still used to some extent, particularly in newspapers, weddings, place names and calligraphy (although it is nowhere near the extent of kanji use in day-to-day Japanese society). Hanja is also extensively used in situations where ambiguity must be avoided, such as academic papers, high-level corporate reports, government documents, and newspapers; this is due to the large number of homonyms that have resulted from extensive borrowing of Chinese words. The issue of ambiguity is the main hurdle in any effort to "cleanse" the Korean language of Chinese characters. Characters convey meaning visually, while alphabets convey guidance to pronunciation, which in turn hints at meaning. As an example, in Korean dictionaries, the phonetic entry for 기사 gisa yields more than 30 different entries. In the past, this ambiguity had been efficiently resolved by parenthetically displaying the associated hanja. When learning how to write hanja, students are taught to memorize the native Korean pronunciation for the hanja's meaning and the Sino-Korean pronunciations (the pronunciation based on the Chinese pronunciation of the characters) for each hanja respectively so that students know what the syllable and meaning is for a particular hanja. For example, the name for the hanja 水 is 물 수 (mul-su) in which 물 (mul) is the native Korean pronunciation for "water", while 수 (su) is the Sino-Korean pronunciation of the character. The naming of hanja is similar to if "water" were named "water-aqua", "horse-equus", or "gold-aurum" based on a hybridization of both the English and the Latin names. Other examples include 사람 인 (saram-in) for 人 "person/people", 큰 대 (keun-dae) for 大 "big/large//great", 작을 소 (jakeul-so) for 小 "small/little", 아래 하 (arae-ha) for 下 "underneath/below/low", 아비 부 (abi-bu) for 父 "father", and 나라이름 한 (naraireum-han) for 韓 "Han/Korea". In North Korea, the hanja system was once completely banned since June 1949 due to fears of collapsed containment of the country; during the 1950s, Kim Il Sung had condemned all sorts of foreign languages (even the newly proposed New Korean Orthography). The ban continued into the 21st century. However, a textbook for university history departments containing 3,323 distinct characters was published in 1971. In the 1990s, school children were still expected to learn 2,000 characters (more than in South Korea or Japan). After Kim Jong Il, the second ruler of North Korea, died in December 2011, Kim Jong Un stepped up and began mandating the use of Hanja as a source of definition for the Korean language. Currently, it is said that North Korea teaches around 3,000 Hanja characters to North Korean students, and in some cases, the characters appear within advertisements and newspapers. However, it is also said that the authorities implore students not to use the characters in public. Due to North Korea's strict isolationism, accurate reports about hanja use in North Korea are hard to obtain. "My mother eats vegetarian food at the pagoda every Sunday", written in the modern Vietnamese alphabet (blue) and Nom. Characters borrowed unchanged from Chinese are shown in green, while invented characters are brown. Although Chinese characters in Vietnam are now limited to ceremonial uses, they were once in widespread use. Until the early 20th century, Literary Chinese was used in Vietnam for all official and scholarly writing. Around the 13th century the Nôm script was developed to record folk literature in the Vietnamese language. The script used Chinese characters to represent both borrowed Sino-Vietnamese vocabulary and native words with similar pronunciation or meaning. In addition thousands of new compound characters were created to write Vietnamese words. This process resulted in a highly complex system that was never mastered by more than 5% of the population. Both Literary Chinese and Nôm were replaced in the early 20th century by Vietnamese written with the Latin-based Vietnamese alphabet. Several minority languages of south and southwest China were formerly written with scripts based on Chinese characters but also including many locally created characters. The most extensive is the sawndip script for the Zhuang language of Guangxi which is still used to this day. Other languages written with such scripts include Miao, Yao, Bouyei, Kam, Bai and Hani. All these languages are now written using Latin-based scripts. The foreign dynasties that ruled northern China between the 10th and 13th centuries developed scripts that were inspired by Chinese characters but did not use them directly: the Khitan large script, Khitan small script, Tangut script and Jurchen script. Other scripts in China that borrowed or adapted a few Chinese characters but are otherwise distinct include Geba script, Sui script, Yi script and the Lisu syllabary. 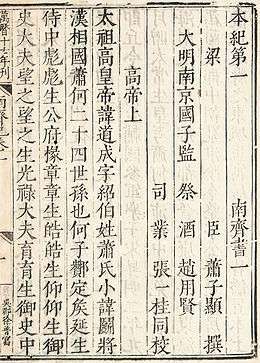 Mongolian text from The Secret History of the Mongols in Chinese transcription, with a glossary on the right of each row. Along with Persian and Arabic, Chinese characters were also used as a foreign script to write the Mongolian language, where characters were used to phonetically transcribe Mongolian sounds. Most notably, the only surviving copies of The Secret History of the Mongols were written in such a manner; the Chinese characters 忙豁侖紐察 脫[卜]察安 (pinyin: mánghuōlúnniǔchá tuō[bo]chá'ān) is the rendering of Mongγol-un niγuca tobčiyan, the title in Mongolian. Chinese characters were also used to phonetically transcribe the Manchu language in the Qing dynasty. According to the Rev. John Gulick: "The inhabitants of other Asiatic nations, who have had occasion to represent the words of their several languages by Chinese characters, have as a rule used unaspirated characters for the sounds, g, d, b. The Muslims from Arabia and Persia have followed this method … The Mongols, Manchu, and Japanese also constantly select unaspirated characters to represent the sounds g, d, b, and j of their languages. These surrounding Asiatic nations, in writing Chinese words in their own alphabets, have uniformly used g, d, b, & c., to represent the unaspirated sounds." Chinese character simplification is the overall reduction of the number of strokes in the regular script of a set of Chinese characters. The use of traditional Chinese characters versus simplified Chinese characters varies greatly, and can depend on both the local customs and the medium. Before the official reform, character simplifications were not officially sanctioned and generally adopted vulgar variants and idiosyncratic substitutions. Orthodox variants were mandatory in printed works, while the (unofficial) simplified characters would be used in everyday writing or quick notes. Since the 1950s, and especially with the publication of the 1964 list, the People's Republic of China has officially adopted simplified Chinese characters for use in mainland China, while Hong Kong, Macau, and the Republic of China (Taiwan) were not affected by the reform. There is no absolute rule for using either system, and often it is determined by what the target audience understands, as well as the upbringing of the writer. Although most often associated with the People's Republic of China, character simplification predates the 1949 communist victory. Caoshu, cursive written text, almost always includes character simplification, and simplified forms have always existed in print, albeit not for the most formal works. In the 1930s and 1940s, discussions on character simplification took place within the Kuomintang government, and a large number of Chinese intellectuals and writers have long maintained that character simplification would help boost literacy in China. Indeed, this desire by the Kuomintang to simplify the Chinese writing system (inherited and implemented by the Communist Party of China) also nursed aspirations of some for the adoption of a phonetic script based on the Latin script, and spawned such inventions as the Gwoyeu Romatzyh. The People's Republic of China issued its first round of official character simplifications in two documents, the first in 1956 and the second in 1964. A second round of character simplifications (known as erjian, or "second round simplified characters") was promulgated in 1977. It was poorly received, and in 1986 the authorities rescinded the second round completely, while making six revisions to the 1964 list, including the restoration of three traditional characters that had been simplified: 叠 dié, 覆 fù, 像 xiàng. The majority of simplified characters are drawn from conventional abbreviated forms, or ancient standard forms. For example, the orthodox character 來 lái ("come") was written with the structure 来 in the clerical script (隶书 / 隸書, lìshū) of the Han dynasty. This clerical form uses one fewer stroke, and was thus adopted as a simplified form. The character 雲 yún ("cloud") was written with the structure 云 in the oracle bone script of the Shang dynasty, and had remained in use later as a phonetic loan in the meaning of "to say" while the 雨 radical was added to differentiate meanings. The simplified form adopts the original structure. In the years after World War II, the Japanese government also instituted a series of orthographic reforms. Some characters were given simplified forms called shinjitai (新字体, lit. "new character forms"); the older forms were then labelled the kyūjitai (旧字体, lit. "old character forms"). The number of characters in common use was restricted, and formal lists of characters to be learned during each grade of school were established, first the 1850-character tōyō kanji (当用漢字) list in 1945, the 1945-character jōyō kanji (常用漢字) list in 1981, and a 2136-character reformed version of the jōyō kanji in 2010. Many variant forms of characters and obscure alternatives for common characters were officially discouraged. This was done with the goal of facilitating learning for children and simplifying kanji use in literature and periodicals. These are simply guidelines, hence many characters outside these standards are still widely known and commonly used, especially those used for personal and place names (for the latter, see jinmeiyō kanji), as well as for some common words such as "dragon" (竜/龍, tatsu) in which both old and new forms of the kanji are both acceptable and widely known amongst native Japanese speakers. Singapore underwent three successive rounds of character simplification. These resulted in some simplifications that differed from those used in mainland China. It ultimately adopted the reforms of the People's Republic of China in their entirety as official, and has implemented them in the educational system. However, unlike in China, personal names may still be registered in traditional characters. Malaysia started teaching a set of simplified characters at schools in 1981, which were also completely identical to the Mainland China simplifications. Chinese newspapers in Malaysia are published in either set of characters, typically with the headlines in traditional Chinese while the body is in simplified Chinese. Although in both countries the use of simplified characters is universal among the younger Chinese generation, a large majority of the older Chinese literate generation still use the traditional characters. Chinese shop signs are also generally written in traditional characters. In the Philippines, most Chinese schools and businesses still use the traditional characters and bopomofo, owing from influence from the Republic of China (Taiwan) due to the shared Hokkien heritage. Recently, however, more Chinese schools now use both simplified characters and pinyin. Since most readers of Chinese newspapers in the Philippines belong to the older generation, they are still published largely using traditional characters. Public and private Chinese signage in the United States and Canada most often use Traditional Characters. There is some effort to get municipal governments to implement more simplified character signage due to recent immigration from Mainland China. Most community newspapers printed the North America are also printed in Traditional Characters. The following is a comparison of Chinese characters in the Standard Form of National Characters, a common traditional Chinese standard used in Taiwan, the Table of General Standard Chinese Characters, the standard for Mainland Chinese simplified Chinese characters, and the jōyō kanji, the standard for Japanese kanji. Generally, the jōyō kanji are more similar to traditional Chinese characters than simplified Chinese characters are to traditional Chinese characters. "Simplified" refers to having significant differences from the Taiwan standard, not necessarily being a newly created character or a newly performed substitution. The characters in the Hong Kong standard and the Kangxi Dictionary are also known as "Traditional," but are not shown. There are numerous styles, or scripts, in which Chinese characters can be written, deriving from various calligraphic and historical models. Most of these originated in China and are now common, with minor variations, in all countries where Chinese characters are used. The Shang dynasty oracle bone script and the Zhou dynasty scripts found on Chinese bronze inscriptions are no longer used; the oldest script that is still in use today is the Seal Script (篆書(书), zhuànshū). It evolved organically out of the Spring and Autumn period Zhou script, and was adopted in a standardized form under the first Emperor of China, Qin Shi Huang. The seal script, as the name suggests, is now used only in artistic seals. Few people are still able to read it effortlessly today, although the art of carving a traditional seal in the script remains alive; some calligraphers also work in this style. Scripts that are still used regularly are the "Clerical Script" (隸書(隶书), lìshū) of the Qin dynasty to the Han dynasty, the Weibei (魏碑, wèibēi), the "Regular Script" (楷書(书), kǎishū), which is used mostly for printing, and the "Semi-cursive Script" (行書(书), xíngshū), used mostly for handwriting. The cursive script (草書(书), cǎoshū, literally "grass script") is used informally. The basic character shapes are suggested, rather than explicitly realized, and the abbreviations are sometimes extreme. Despite being cursive to the point where individual strokes are no longer differentiable and the characters often illegible to the untrained eye, this script (also known as draft) is highly revered for the beauty and freedom that it embodies. Some of the simplified Chinese characters adopted by the People's Republic of China, and some simplified characters used in Japan, are derived from the cursive script. The Japanese hiragana script is also derived from this script. There also exist scripts created outside China, such as the Japanese Edomoji styles; these have tended to remain restricted to their countries of origin, rather than spreading to other countries like the Chinese scripts. Chinese calligraphy of mixed styles written by Song dynasty (1051–1108 AD) poet Mifu. For centuries, the Chinese literati were expected to master the art of calligraphy. The art of writing Chinese characters is called Chinese calligraphy. It is usually done with ink brushes. In ancient China, Chinese calligraphy is one of the Four Arts of the Chinese Scholars. There is a minimalist set of rules of Chinese calligraphy. Every character from the Chinese scripts is built into a uniform shape by means of assigning it a geometric area in which the character must occur. Each character has a set number of brushstrokes; none must be added or taken away from the character to enhance it visually, lest the meaning be lost. Finally, strict regularity is not required, meaning the strokes may be accentuated for dramatic effect of individual style. Calligraphy was the means by which scholars could mark their thoughts and teachings for immortality, and as such, represent some of the more precious treasures that can be found from ancient China. The first four characters of Thousand Character Classic in different typeface styles script styles and type styles. From right to left: seal script, clerical script, regular script, Ming and sans-serif. Ming and sans-serif are the most popular in body text and are based on regular script for Chinese characters akin to Western serif and sans-serif typefaces, respectively. Regular script typefaces emulate regular script. The Song typeface (宋体 / 宋體, sòngtǐ) is known as the Ming typeface (明朝, minchō) in Japan, and it is also somewhat more commonly known as the Ming typeface (明体 / 明體, míngtǐ) than the Song typeface in Taiwan and Hong Kong. The names of these styles come from the Song and Ming dynasties, when block printing flourished in China. Sans-serif typefaces, called black typeface (黑体 / 黑體, hēitǐ) in Chinese and Gothic typeface (ゴシック体) in Japanese, are characterized by simple lines of even thickness for each stroke, akin to sans-serif styles such as Arial and Helvetica in Western typography. Regular script typefaces are also commonly used, but not as common as Ming or sans-serif typefaces for body text. Regular script typefaces are often used to teach students Chinese characters, and often aim to match the standard forms of the region where they are meant to be used. Most typefaces in the Song dynasty were regular script typefaces which resembled a particular person's handwriting (e.g. the handwriting of Ouyang Xun, Yan Zhenqing, or Liu Gongquan), while most modern regular script typefaces tend toward anonymity and regularity. Variants of the Chinese character for guī 'turtle', collected c. 1800 from printed sources. The one at left is the traditional form used today in Taiwan and Hong Kong, 龜, though 龜 may look slightly different, or even like the second variant from the left, depending on your font (see Wiktionary). The modern simplified forms used in China, 龟, and in Japan, 亀, are most similar to the variant in the middle of the bottom row, though neither is identical. A few more closely resemble the modern simplified form of the character for diàn 'lightning', 电. Five of the 30 variant characters found in the preface of the Imperial (Kangxi) Dictionary which are not found in the dictionary itself. They are 為 (爲) wèi "due to", 此 cǐ "this", 所 suǒ "place", 能 néng "be able to", 兼 jiān "concurrently". (Although the form of 為 is not very different, and in fact is used today in Japan, the radical 爪 has been obliterated.) Another variant from the preface, 来 for 來 lái "to come", also not listed in the dictionary, has been adopted as the standard in Mainland China and Japan. The character 次 in Simplified and Traditional Chinese, Japanese, and Korean. If you have an appropriate font installed, you can see the corresponding character in Vietnamese: 次. Just as Roman letters have a characteristic shape (lower-case letters mostly occupying the x-height, with ascenders or descenders on some letters), Chinese characters occupy a more or less square area in which the components of every character are written to fit in order to maintain a uniform size and shape, especially with small printed characters in Ming and sans-serif styles. Because of this, beginners often practise writing on squared graph paper, and the Chinese sometimes use the term "Square-Block Characters" (方块字 / 方塊字, fāngkuàizì), sometimes translated as tetragraph, in reference to Chinese characters. Despite standardization, some nonstandard forms are commonly used, especially in handwriting. In older sources, even authoritative ones, variant characters are commonplace. For example, in the preface to the Imperial Dictionary, there are 30 variant characters which are not found in the dictionary itself. A few of these are reproduced at right. The nature of Chinese characters makes it very easy to produce allographs for many characters, and there have been many efforts at orthographical standardization throughout history. In recent times, the widespread usage of the characters in several nations has prevented any particular system becoming universally adopted and the standard form of many Chinese characters thus varies in different regions. Mainland China adopted simplified Chinese characters in 1956. They are also used in Singapore. Traditional Chinese characters are used in Hong Kong, Macau and Taiwan. Postwar Japan has used its own less drastically simplified characters, Shinjitai, since 1946, while South Korea has limited its use of Chinese characters, and Vietnam and North Korea have completely abolished their use in favour of Vietnamese alphabet and Hangul, respectively. The List of Frequently Used Characters in Modern Chinese for Mainland China. The List of Forms of Frequently Used Characters for Hong Kong. The Standard Form of National Characters for Taiwan. The list of Jōyō kanji for Japan. 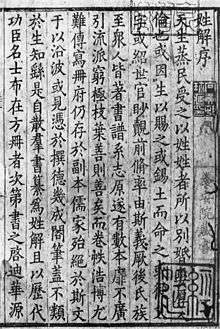 The Kangxi Dictionary (de facto) for Korea. In addition to strictness in character size and shape, Chinese characters are written with very precise rules. The most important rules regard the strokes employed, stroke placement, and stroke order. Just as each region that uses Chinese characters has standardized character forms, each also has standardized stroke orders, with each standard being different. Most characters can be written with just one correct stroke order, though some words also have many valid stroke orders, which may occasionally result in different stroke counts. Some characters are also written with different stroke orders due to character simplification. Chinese characters are primarily morphosyllabic, meaning that most Chinese morphemes are monosyllabic and are written with a single character, though in modern Chinese most words are disyllabic and dimorphemic, consisting of two syllables, each of which is a morpheme. In modern Chinese 10% of morphemes only occur as part of a given compound. However, a few morphemes are disyllabic, some of them dating back to Classical Chinese. Excluding foreign loan words, these are typically words for plants and small animals. They are usually written with a pair of phono-semantic compound characters sharing a common radical. Examples are 蝴蝶 húdié "butterfly" and 珊瑚 shānhú "coral". Note that the 蝴 hú of húdié and the 瑚 hú of shānhú have the same phonetic, 胡, but different radicals ("insect" and "jade", respectively). Neither exists as an independent morpheme except as a poetic abbreviation of the disyllabic word. In certain cases compound words and set phrases may be contracted into single characters. Some of these can be considered logograms, where characters represent whole words rather than syllable-morphemes, though these are generally instead considered ligatures or abbreviations (similar to scribal abbreviations, such as & for "et"), and as non-standard. These do see use, particularly in handwriting or decoration, but also in some cases in print. In Chinese, these ligatures are called héwén (合文), héshū (合書) or hétǐzì (合体字), and in the special case of combining two characters, these are known as "two-syllable Chinese characters" (双音节汉字, 雙音節漢字). A commonly seen example is the double happiness symbol 囍, formed as a ligature of 喜喜 and referred to by its disyllabic name (simplified Chinese: 双喜; traditional Chinese: 雙喜; pinyin: shuāngxǐ). In handwriting, numbers are very frequently squeezed into one space or combined – common ligatures include 廿 niàn, "twenty", normally read as 二十 èrshí, 卅 sà, "thirty", normally read as 三十 sānshí, and 卌 xì "forty", normally read as 四十 "sìshí". Calendars often use numeral ligatures in order to save space; for example, the "21st of March" can be read as 三月廿一. In some cases counters are also merged into one character, such as 七十人 qīshí rén "seventy people". Another common abbreviation is 门 with a "T" written inside it, for 問題, 问题, wèntí ("question; problem"), where the "T" is from pinyin for the second syllable tí 题. Since polysyllabic characters are often non-standard, they are often excluded in character dictionaries. Modern examples particularly include Chinese characters for SI units. In Chinese these units are disyllabic and standardly written with two characters, as 厘米 límǐ "centimeter" (厘 centi-, 米 meter) or 千瓦 qiānwǎ "kilowatt". However, in the 19th century these were often written via compound characters, pronounced disyllabically, such as 瓩 for 千瓦 or 糎 for 厘米 – some of these characters were also used in Japan, where they were pronounced with borrowed European readings instead. These have now fallen out of general use, but are occasionally seen. Less systematic examples include 圕 túshūguǎn "library", a contraction of 圖書館, A four-morpheme word, 社会主义 shèhuì zhǔyì "socialism", is commonly written with a single character formed by combining the last character, 义, with the radical of the first, 社, yielding roughly 礻义. The use of such contractions is as old as Chinese characters themselves, and they have frequently been found in religious or ritual use. In the Oracle Bone script, personal names, ritual items, and even phrases such as 受又(祐) shòu yòu "receive blessings" are commonly contracted into single characters. A dramatic example is that in medieval manuscripts 菩薩 púsà "bodhisattva" (simplified: 菩萨) is sometimes written with a single character formed of a 2×2 grid of four 十 (derived from the grass radical over two 十). However, for the sake of consistency and standardization, the CPC seeks to limit the use of such polysyllabic characters in public writing to ensure that every character only has one syllable. Conversely, with the fusion of the diminutive -er suffix in Mandarin, some monosyllabic words may even be written with two characters, as in 花儿 huār "flower", which was formerly disyllabic. 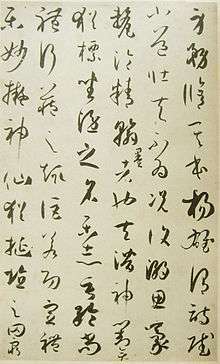 In most other languages that use the Chinese family of scripts, notably Korean, Vietnamese, and Zhuang, Chinese characters are typically monosyllabic, but in Japanese a single character is generally used to represent a borrowed monosyllabic Chinese morpheme (the on'yomi), an polysyllabic native Japanese morpheme (the kun'yomi), or even (in rare cases) a foreign loanword. These uses are completely standard and unexceptional. Often a character not commonly used (a "rare" or "variant" character) will appear in a personal or place name in Chinese, Japanese, Korean, and Vietnamese (see Chinese name, Japanese name, Korean name, and Vietnamese name, respectively). This has caused problems as many computer encoding systems include only the most common characters and exclude the less often used characters. This is especially a problem for personal names which often contain rare or classical, antiquated characters. One man who has encountered this problem is Taiwanese politician Yu Shyi-kun, due to the rarity of the last character in his name. Newspapers have dealt with this problem in varying ways, including using software to combine two existing, similar characters, including a picture of the personality, or, especially as is the case with Yu Shyi-kun, simply substituting a homophone for the rare character in the hope that the reader would be able to make the correct inference. Taiwanese political posters, movie posters etc. will often add the bopomofo phonetic symbols next to such a character. Japanese newspapers may render such names and words in katakana instead of kanji, and it is accepted practice for people to write names for which they are unsure of the correct kanji in katakana instead. There are also some extremely complex characters which have understandably become rather rare. According to Joël Bellassen (1989), the most complex Chinese character is /𪚥 (U+2A6A5) zhé listen , meaning "verbose" and containing sixty-four strokes; this character fell from use around the 5th century. It might be argued, however, that while containing the most strokes, it is not necessarily the most complex character (in terms of difficulty), as it simply requires writing the same sixteen-stroke character 龍 lóng (lit. "dragon") four times in the space for one. Another 64-stroke character is /𠔻 (U+2053B) zhèng composed of 興 xīng/xìng (lit. "flourish") four times. One of the most complex characters found in modern Chinese dictionaries[lower-alpha 8] is 齉 (U+9F49) (nàng, listen , pictured below, middle image), meaning "snuffle" (that is, a pronunciation marred by a blocked nose), with "just" thirty-six strokes. However, this is not in common use. The most complex character that can be input using the Microsoft New Phonetic IME 2002a for traditional Chinese is 龘 (dá, "the appearance of a dragon flying"). It is composed of the dragon radical represented three times, for a total of 16 × 3 = 48 strokes. Among the most complex characters in modern dictionaries and also in frequent modern use are 籲 (yù, "to implore"), with 32 strokes; 鬱 (yù, "luxuriant, lush; gloomy"), with 29 strokes, as in 憂鬱 (yōuyù, "depressed"); 豔 (yàn, "colorful"), with 28 strokes; and 釁 (xìn, "quarrel"), with 25 strokes, as in 挑釁 (tiǎoxìn, "to pick a fight"). Also in occasional modern use is 鱻 (xiān "fresh"; variant of 鮮 xiān) with 33 strokes. In Japanese, an 84-stroke kokuji exists: , normally read taito. It is composed of three "cloud" (雲) characters on top of the abovementioned triple "dragon" character (龘). Also meaning "the appearance of a dragon in flight", it has been pronounced おとど otodo, たいと taito, and だいと daito. The most elaborate character in the jōyō kanji list is the 29-stroke 鬱, meaning "depression" or "melancholy". The most complex Chinese character still in use may be biáng (pictured right, bottom), with 58 strokes, which refers to Biang biang noodles, a type of noodle from China's Shaanxi province. This character along with the syllable biang cannot be found in dictionaries. The fact that it represents a syllable that does not exist in any Standard Chinese word means that it could be classified as a dialectal character. Nàng, "poor enunciation due to snuffle"
Taito, "the appearance of a dragon in flight"
The total number of Chinese characters from past to present remains unknowable because new ones are being developed all the time – for instance, brands may create new characters when none of the existing ones allow for the intended meaning – or they have been invented by whoever wrote them and have never been adopted as official characters. Chinese characters are theoretically an open set and anyone can create new characters, though such inventions are rarely included in official character sets. The number of entries in major Chinese dictionaries is the best means of estimating the historical growth of character inventory. Even the Zhonghua Zihai does not include characters in the Chinese family of scripts created to represent non-Chinese languages. Characters formed by Chinese principles in other languages include the roughly 1,500 Japanese-made kokuji given in the Kokuji no Jiten, the Korean-made gukja, the over 10,000 Sawndip characters still in use in Guangxi, and the almost 20,000 Nôm characters formerly used in Vietnam. More divergent descendents of Chinese script include Tangut script, which created over 5,000 characters with similar strokes but different formation principles to Chinese characters. Modified radicals and new variants are two common reasons for the ever-increasing number of characters. There are about 300 radicals and 100 are in common use. Creating a new character by modifying the radical is an easy way to disambiguate homographs among xíngshēngzì pictophonetic compounds. This practice began long before the standardization of Chinese script by Qin Shi Huang and continues to the present day. 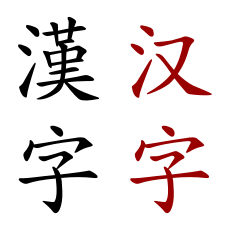 The traditional 3rd-person pronoun tā (他 "he, she, it"), which is written with the "person radical", illustrates modifying significs to form new characters. In modern usage, there is a graphic distinction between tā (她 "she") with the "woman radical", tā (牠 "it") with the "animal radical", tā (它 "it") with the "roof radical", and tā (祂 "He") with the "deity radical", One consequence of modifying radicals is the fossilization of rare and obscure variant logographs, some of which are not even used in Classical Chinese. For instance, he 和 "harmony, peace", which combines the "grain radical" with the "mouth radical", has infrequent variants 咊 with the radicals reversed and 龢 with the "flute radical". Chinese characters should not be confused with Chinese words, as the majority of modern Chinese words, unlike their Old Chinese and Middle Chinese counterparts, are written with two or more characters, each character representing one syllable and/or morpheme. Knowing the meanings of the individual characters of a word will often allow the general meaning of the word to be inferred, but this is not always the case. Studies in China have shown that literate individuals know and use between 3,000 and 4,000 characters. Specialists in classical literature or history, who would often encounter characters no longer in use, are estimated to have a working vocabulary of between 5,000 and 6,000 characters. In China, which uses simplified Chinese characters, the Xiàndài Hànyǔ Chángyòng Zìbiǎo (现代汉语常用字表, Chart of Common Characters of Modern Chinese) lists 2,500 common characters and 1,000 less-than-common characters, while the Xiàndài Hànyǔ Tōngyòng Zìbiǎo (现代汉语通用字表, Chart of Generally Utilized Characters of Modern Chinese) lists 7,000 characters, including the 3,500 characters already listed above. GB2312, an early version of the national encoding standard used in the People's Republic of China, has 6,763 code points. GB18030, the modern, mandatory standard, has a much higher number. The New Hànyǔ Shuǐpíng Kǎoshì (汉语水平考试, Chinese Proficiency Test) covers approximately 2,600 characters at its highest level (level six). In the Republic of China (Taiwan), which uses traditional Chinese characters, the Ministry of Education's Chángyòng Guózì Biāozhǔn Zìtǐ Biǎo (常用國字標準字體表, Chart of Standard Forms of Common National Characters) lists 4,808 characters; the Cì Chángyòng Guózì Biāozhǔn Zìtǐ Biǎo (次常用國字標準字體表, Chart of Standard Forms of Less-Than-Common National Characters) lists another 6,341 characters. The Chinese Standard Interchange Code (CNS11643)—the official national encoding standard—supports 48,027 characters, while the most widely used encoding scheme, BIG-5, supports only 13,053. In Hong Kong, which uses traditional Chinese characters, the Education and Manpower Bureau's Soengjung Zi Zijing Biu (常用字字形表), intended for use in elementary and junior secondary education, lists a total of 4,759 characters. In addition, there are a number of dialect characters (方言字) that are not used in formal written Chinese but represent colloquial terms in non-Mandarin varieties of Chinese. One such variety is Written Cantonese, in widespread use in Hong Kong even for certain formal documents, due to the former British colonial administration's recognition of Cantonese for use for official purposes. In Taiwan, there is also a body of characters used to represent Taiwanese Hokkien. Many varieties have specific characters for words exclusive to them. For example, the vernacular character 㓾, pronounced cii11 in Hakka, means "to kill". Furthermore, Shanghainese and Sichuanese also have their own series of characters, but these are not widely used in actual texts, Mandarin being the preference for all mainland regions. In Japanese there are 2,136 jōyō kanji (常用漢字, lit. "frequently used kanji") designated by the Japanese Ministry of Education; these are taught during primary and secondary school. The list is a recommendation, not a restriction, and many characters missing from it are still in common use. One area where character usage is officially restricted is in names, which may contain only government-approved characters. Since the jōyō kanji list excludes many characters that have been used in personal and place names for generations, an additional list, referred to as the jinmeiyō kanji (人名用漢字, lit. "kanji for use in personal names"), is published. It currently contains 983 characters. Today, a well-educated Japanese person may know upwards of 3,500 kanji. The kanji kentei (日本漢字能力検定試験, Nihon Kanji Nōryoku Kentei Shiken or Test of Japanese Kanji Aptitude) tests a speaker's ability to read and write kanji. The highest level of the kanji kentei tests on approximately 6,000 kanji, though in practice few people attain (or need to attain) this level. New characters can in principle be coined at any time, just as new words can be, but they may not be adopted. Significant historically recent coinages date to scientific terms of the 19th century. Specifically, Chinese coined new characters for chemical elements – see chemical elements in East Asian languages – which continue to be used and taught in schools in China and Taiwan. In Japan, in the Meiji era (specifically, late 19th century), new characters were coined for some (but not all) SI units, such as 粁 (米 "meter" + 千 "thousand, kilo-") for kilometer. These kokuji (Japanese-coinages) have found use in China as well – see Chinese characters for SI units for details. While new characters can be easily coined by writing on paper, they are difficult to represent on a computer – they must generally be represented as a picture, rather than as text – which presents a significant barrier to their use or widespread adoption. Compare this with the use of symbols as names in 20th century musical albums such as Led Zeppelin IV (1971) and Love Symbol Album (1993); an album cover may potentially contain any graphics, but in writing and other computation these symbols are difficult to use. Dozens of indexing schemes have been created for arranging Chinese characters in Chinese dictionaries. The great majority of these schemes have appeared in only a single dictionary; only one such system has achieved truly widespread use. This is the system of radicals. Chinese character dictionaries often allow users to locate entries in several ways. Many Chinese, Japanese, and Korean dictionaries of Chinese characters list characters in radical order: characters are grouped together by radical, and radicals containing fewer strokes come before radicals containing more strokes (radical-and-stroke sorting). Under each radical, characters are listed by their total number of strokes. It is often also possible to search for characters by sound, using pinyin (in Chinese dictionaries), zhuyin (in Taiwanese dictionaries), kana (in Japanese dictionaries) or hangul (in Korean dictionaries). Most dictionaries also allow searches by total number of strokes, and individual dictionaries often allow other search methods as well. For instance, to look up the character where the sound is not known, e.g., 松 (pine tree), the user first determines which part of the character is the radical (here 木), then counts the number of strokes in the radical (four), and turns to the radical index (usually located on the inside front or back cover of the dictionary). Under the number "4" for radical stroke count, the user locates 木, then turns to the page number listed, which is the start of the listing of all the characters containing this radical. This page will have a sub-index giving remainder stroke numbers (for the non-radical portions of characters) and page numbers. The right half of the character also contains four strokes, so the user locates the number 4, and turns to the page number given. From there, the user must scan the entries to locate the character he or she is seeking. Some dictionaries have a sub-index which lists every character containing each radical, and if the user knows the number of strokes in the non-radical portion of the character, he or she can locate the correct page directly. 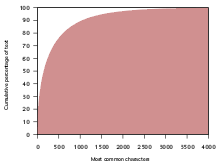 Another dictionary system is the four corner method, where characters are classified according to the shape of each of the four corners. Most modern Chinese dictionaries and Chinese dictionaries sold to English speakers use the traditional radical-based character index in a section at the front, while the main body of the dictionary arranges the main character entries alphabetically according to their pinyin spelling. To find a character with unknown sound using one of these dictionaries, the reader finds the radical and stroke number of the character, as before, and locates the character in the radical index. The character's entry will have the character's pronunciation in pinyin written down; the reader then turns to the main dictionary section and looks up the pinyin spelling alphabetically. ↑ The character for saw, ⿰書史, is supposed to be one character, with a 書 radical on the left, and 史 radical on the right. Similarly, ndip (⿰立生) is one character, made up of 立 and 生 radicals. As of present, there are limitations in displaying Zhuang logograms in Unicode, as they are unsupported. ↑ Abbreviations are occasionally used – see § Polysyllabic characters. ↑ Qiu 2000, pp. 132–3 provides archaeological evidence for this dating, in contrast to unsubstantiated claims dating the beginning of cursive anywhere from the Qin to the Eastern Han. ↑ Qiu 2000, pp. 140–1 mentions examples of neo-clerical with "strong overtones of cursive script" from the late Eastern Han. ↑ Liu is said to have taught Zhong Yao and Wang Xizhi. ↑ Wáng Xīzhī is so credited in essays by other calligraphers in the 6th to early 7th centuries, and most of his extant pieces are in modern cursive script. ↑ (U+9F49) nàng is found, for instance, on p.707 of 漢英辭典(修訂版) A Chinese–English Dictionary, (Revised Edition) Foreign Language Teaching and Research Press, Beijing, 1995. ISBN 7-5600-0739-2. ↑ Potowski, Kim (2010). Language Diversity in the USA. Cambridge: Cambridge University Press. p. 82. ISBN 978-0-521-74533-8. ↑ World Health Organization (2007). WHO international standard terminologies on traditional medicine in the Western Pacific Region. Retrieved 22 June 2015. ↑ Shieh (2011). "The Unified Phonetic Transcription for Teaching and Learning Chinese Languages" Turkish Online Journal of Educational Technology, 10: 355-369. ↑ "History of Chinese Writing Shown in the Museums". CCTV online. Retrieved 2010-03-20. 1 2 Norman 1988, p. 73. ↑ Wood, Clare Patricia; Connelly, Vincent (2009). Contemporary perspectives on reading and spelling. New York: Routledge. p. 203. ISBN 978-0-415-49716-9. ↑ Norman 1988, p. 58. ↑ Wilkinson 2012, p. 22. ↑ Norman 1988, p. 112. ↑ Yip 2000, p. 18. ↑ Norman 1988, pp. 155–156. ↑ Norman 1988, p. 74. ↑ Norman 1988, pp. 74–75. ↑ Swofford, Mark (2010). "Chinese characters with multiple pronunciations". pinyin.info. Retrieved 4 July 2016. ↑ Baxter (1992), pp. 315–317. 1 2 Baxter (1992), p. 315. ↑ Baxter (1992), p. 316. ↑ Baxter (1992), pp. 197, 305. 1 2 Baxter (1992), p. 218. ↑ Baxter (1992), p. 219. ↑ Norman 1988, pp. 58–61. ↑ Norman 1988, pp. 67–69. 1 2 Sampson & Chen 2013. ↑ Boltz 1994, pp. 104–110. ↑ Boltz 1994, p. 169. ↑ Baxter 1992, p. 750. ↑ Baxter 1992, p. 810. ↑ Norman 1988, p. 69. ↑ Baxter 1992, pp. 771, 772. ↑ Yang, Lihui; An, Deming (2008). Handbook of Chinese Mythology. Oxford University Press. pp. 84–86. ISBN 978-0-19-533263-6. ↑ "Carvings may rewrite history of Chinese characters". Xinhua online. 2007-05-18. Retrieved 2007-05-19. ; Unknown (2007-05-18). "Chinese writing '8,000 years old'". BBC News. Retrieved 2007-11-17. 1 2 Paul Rincon (2003-04-17). "Earliest writing'which was found in China". BBC News. ↑ Qiu 2000, p. 31. 1 2 3 4 Kern 2010, p. 1. ↑ Keightley 1978, p. xvi. ↑ Boltz (1986), p. 424. 1 2 Kern 2010, p. 2. ↑ Qiu 2000, pp. 63–4, 66, 86, 88–9, 104–7, 124. ↑ Qiu 2000, pp. 59–150. ↑ Qiu 2000, p. 104. ↑ Qiu 2000, pp. 59, 104–7. ↑ Qiu 2000, p. 119. ↑ Qiu 2000, p. 123. ↑ Qiu 2000, pp. 119, 123–4. ↑ Qiu 2000, p. 130. ↑ Qiu 2000, p. 121. ↑ Qiu 2000, pp. 131, 133. 1 2 3 4 5 Qiu 2000, p. 138. ↑ Qiu 2000, p. 131. 1 2 Qiu 2000, pp. 113, 139. 1 2 Qiu 2000, p. 139. ↑ Qiu 2000, p. 142. ↑ Qiu 2000, p. 140. ↑ Transcript of lecture 《楷法無欺》 by 田英章. Retrieved 2010-05-22. 1 2 Qiu 2000, p. 143. ↑ Qiu 2000, p. 144. 1 2 Qiu 2000, p. 148. ↑ Qiu 2000, p. 145. ↑ Coulmas 1991, pp. 122–129. ↑ Coulmas 1991, pp. 129–132. ↑ Coulmas 1991, pp. 132–133. ↑ Hannas (1997), pp. 68–72. ↑ "Hanja Lesson 1: 大, 小, 中, 山, 門 | How to study Korean". www.howtostudykorean.com. Retrieved 2016-03-09. ↑ Hannas 1997, p. 68. ↑ Kim Hye-jin (2001-06-04). "북한의 한자정책 - "漢字, 3000자까지 배우되 쓰지는 말라"". Han Mun Love. Chosun Ilbo. Retrieved November 21, 2014. ↑ Coulmas 1991, pp. 113–115. ↑ DeFrancis, John (1977). Colonialism and language policy in Viet Nam. Mouton. ISBN 978-90-279-7643-7. 1 2 Zhou, Youguang (September 1991). "The Family of Chinese Character-Type Scripts (Twenty Members and Four Stages of Development)". Sino-Platonic Papers. 28. Retrieved June 7, 2011. ↑ Rev. John Gulick (November 1870) "On the best method of representing the unaspirated mutes of the Mandarin dialect," The Chinese Recorder and Missionary Journal, vol. 3, pages 153-155. ↑ Ramsey 1987, p. 147. ↑ Mair, Victor H. (September 2009). "danger + opportunity ≠ crisis: How a misunderstanding about Chinese characters has led many astray". Retrieved August 20, 2010. ↑ Montucci, 1817. Urh-chĭh-tsze-tëen-se-yĭn-pe-keáou; being a parallel drawn between the two intended Chinese dictionaries; by the Rev. Robert Morrison, and Antonio Montucci, LL. D.
↑ Norman 1988, pp. 8–9. ↑ "Polysyllabic characters in Chinese writing". Language Log. Retrieved 2016-04-11. ↑ Sanseido Word-Wise Web ［三省堂辞書サイト］ » 漢字の現在：幽霊文字からキョンシー文字へ？ [From ghost character to vampire character?]. Retrieved January 24, 2015. ↑ "Creating New Chinese Characters". 1 2 3 4 5 Zhou 2003, p. 72. ↑ Qiu 2000, p. 48. 1 2 3 4 5 Yip 2000, p. 19. ↑ Pulleyblank 1984, p. 139. 1 2 Zhou 2003, p. 73. ↑ Yong & Peng 2008, pp. 198–199. ↑ Yong & Peng 2008, p. 199. ↑ Yong & Peng 2008, p. 170. ↑ Yong & Peng 2008, p. 289. ↑ Yong & Peng 2008, p. 295. ↑ Yong & Peng 2008, p. 276. ↑ Wilkinson 2012, p. 46. ↑ Hida & Sugawara, 1990, Tokyodo Shuppan. ↑ Da Jun (2004), Chinese text computing. ↑ "What is Chinese Proficiency Test?". Retrieved 11 November 2015. ↑ "What are the Jōyō Kanji?". sci.lang.japan FAQ. Retrieved 11 November 2015. ↑ "What are the Jinmeiyō Kanji?". sci.lang.japan FAQ. Retrieved 11 November 2015. ↑ "Kanji Kentei". sci.lang.japan FAQ. Retrieved 11 November 2015. ↑ Koichi. "The Ultimate Kanji Test: Kanji Kentei". Tofugu. Retrieved 11 November 2015. This article incorporates text from The Chinese recorder and missionary journal, Volume 3, a publication from 1871 now in the public domain in the United States. Boltz, William G. (1986). "Early Chinese Writing". World Archaeology. 17 (3): 420–436. doi:10.1080/00438243.1986.9979980. JSTOR 124705. —— (1994). The origin and early development of the Chinese writing system. New Haven: American Oriental Society. ISBN 978-0-940490-78-9. Hannas, Wm. C. (1997). Asia's Orthographic Dilemma. University of Hawaii Press. ISBN 978-0-8248-1892-0. —— (1996). "Art, Ancestors, and the Origins of Writing in China". Representations. 56: 68–95. JSTOR 2928708. Kern, Martin (2010). "Early Chinese literature, beginnings through Western Han". In Owen, Stephen. The Cambridge History of Chinese Literature, vol. 1: To 1375. Cambridge: Cambridge University Press. pp. 1–115. ISBN 978-0-521-85558-7. Sampson, Geoffrey; Chen, Zhiqun (2013). The reality of compound ideographs (PDF). Journal of Chinese Linguistics. 41. pp. 255–272. Zhou, Youguang (2003). The Historical Evolution of Chinese Languages and Scripts. Translated by Zhang Liqing. Columbus: National East Asian Languages Resource Center, Ohio State University. ISBN 0-87415-349-2. Galambos, Imre (2006). Orthography of early Chinese writing: evidence from newly excavated manuscripts (PDF). Budapest: Eötvös Loránd University. ISBN 978-963-463-811-7. Herbert Allen Giles (1892). A Chinese-English dictionary, Volume 1. B. Quaritch. p. 1415. P. Poletti (1896). A Chinese and English dictionary, arranged according to radicals and sub-radicals. Printed at the American Presbyterian mission press. p. 307. William Edward Soothill (1900). The student's four thousand [characters] and general pocket dictionary (2 ed.). American Presbyterian Mission Press. p. 420. John Chalmers (1882). An account of the structure of Chinese characters under 300 primary forms: after the Shwoh-wan, 100 A.D., and the phonetic Shwoh-wan, 1833. Trübner & co. p. 199. Chinese and English dictionary: compiled from reliable authors. American Tract Society. 1893. p. 348. Joseph Edkins (1876). Introduction to the study of the Chinese characters. Trübner & co. p. 314. Chinese and English dictionary: compiled from reliable authors. American Tract Society. 1893. Retrieved 2011-05-15. Kangxi (Emperor of China) (1842). Chinese and English dictionary: containing all the words in the Chinese imperial dictionary; arranged according to the radicals, Volume 1. Printed at Parapattan. Retrieved 2011-05-15.